Hey fellow Maggotkin! I (almost entirely) finished painting my first model! This Putrid Blightking is lacking a base banner color and a satin varnish, but beyond that he's basically done! I think I'll go back and touch up his apron when I paint the other PBKs, though. Feel free to ask any questions about the paint job or basing. I learned a great technique from my local GW manager: to get cork board edges to firm up and look less jagged, apply PVA glue to the edges. For the list, this one utilizes a Beastmen battalion: Leaders: Great Unclean One: General, Tome of a Thousand Poxes, Grandfather's Blessing, Favoured Poxes, Blade and Bell configuration Lord of Blights: Rustfang Festus the Leechlord: Blades of Putrefaction Great Bray-Shaman Battlelines: Ungors x10 Ungors x10 Ungors x10 Putrid Blightkings x10 Other Units: Centigors x20 5x Tuskgor Chariots x1 Endless Spells: Soulsnare Shackles Battalions: Pestilent Throng The strategy this list employs involves sending the Centigors and chariots flying across the battlefield on turn 1, pinning the opponent in his or her deployment zone while your army takes up advantageous positions. When near the GUO and GB-S, the beastmen units get +6" to their movement, meaning the chariots will move 16" and the Centigors will move 20". The latter can run and charge natively, and the former can use the Feculent Gnarlmaw, since the battalion gives them the Nurgle keyword. The other gift it provides is that, upon death, all the beastmen in this list will "explode" on a 2+, dealing one mortal wound to all enemy units within 7". So after pinning the opponent in place early, the chariots will splatter a MW over hopefully a few units. The Centigors have an ability that gives them +1 to hit in exchange for being +1 to hit for opponents. The downside of that can be addressed by the Lord of Blight's command ability. If BoP goes off, they do MWs on 5+ with 4 attacks each, for a total of 81 attacks that reroll wounds on a turn in which they charged, likely wiping out whatever they hit. 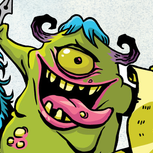 The Ungors are 60 pts for a unit of 10 and are needed for the battalion; they just try to screen and be annoying. ﻿ The GB-S can use his Devolve spell to move enemy units out of cover and into combat, if desired. The Blight Kings and LoB move into the thick of things and contest for central objectives. Let me know what you think of the list and the painted up PBK! Next time I'll offer up another competitive list and hopefully some more pictures of the rest of the unit. 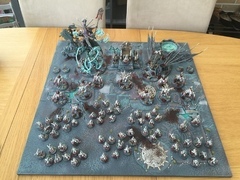 500p 500pt Nighthaunt : how to? Is there anything stopping you from having more than one stormhost in your army/force ? I painted my Starter set as Hammers of Sigmar but I fancy painting the Soulwars guys in a different scheme. 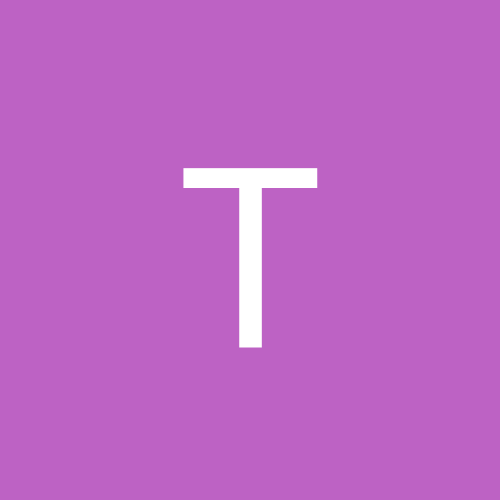 I'm asking from a gaming point of view, rules, abilities etc. I am working on a 1000 point destruction list, and i have 300 points to use. I am wondering what to do with these points. Making a 1500p/2000p list that’s all around good! Ok guys I need some help making a 1000pt death list which MUST include Arkhan. I do already have a simple 1000pt death list but I have a game coming up in a week which I need to include Arkhan for reasons. I'm stuck making a list that'll actually work so maybe one of you amazing people have some awesome ideas Thanks for the help! Looking to sell my Stormcast army in order to fund new conversion and painting projects, I understand people like to haggle but the listed price is all I'm willing to part with it for. The army is also on ebay so if it sell there first I will remove this post, thank you. £350 plus £12.50 tracked postage (or collection from Nottingham) Containing: One Templar on Stardrake conversion (ruined wall basing needs painting) One Lord Relictor Conversion 3 x Prosecutors with Javalins (Prime has a trident) 3 x Vanguard Raptors with Longstrike Bows 3 x Vanguard Raptors with Hurricane Crossbows 2 x Fulminators converted to ride Gryph Chargers 2 x Concussors converted to ride Gryph Chargers 1 x Lord Aquillor 2 x 5 Vanguard Hunters (Prime and Astral compass in each unit) 10 x Liberators (Hammer and Shield, Prime with grand hammer, second model with grand hammer) 10 x Liberators (Sword and Shield, Prime with Grand Blade, second model with grand blade) 15 x Protectors (Including one prime, converted helmets) All models provided as photographed. Greetings fellow generals! 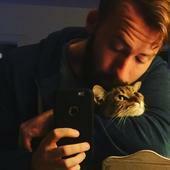 I'm 27 years old, danish but currently living in Malmö, Sweden. I used to play Warhammer fantasy back in 5th and 6th edition i think (99-03?ish). When I got a little older (15-16yrs) I stopped completely and I didn't touch a mini for the next 10 years. But then on a spring day in 2015 - I don't know exactly why - call of chaos perhaps?? - I felt the need to start a new army. This was only a couple of months prior to the release of Age of Sigmar. 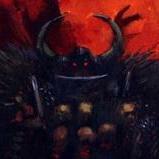 To my pleasure - I would read about the glory of Archaon and the End Times. But now a new era was upon us... Age of Sigmar was of course a perfect opportunity for me to re-enter the hobby and start once again from scratch. 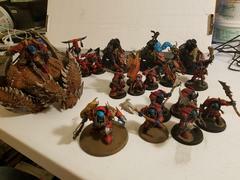 Now I've spent the last two years on building my Khorne army which now is around 1200 points painted. It's been a bumpy road - I definitely underestimated the amount of work a nicely painted army requires - but this last year I've really found a good rhythm with my painting. 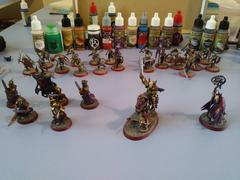 Now my army is really starting to take form and I'm going to show it of soon here on TGA. I'm a faithful viewer/listener of Warhammer Weekly - which really helped my a lot in my battle against the grey You'll hear more from me in the future I salute you all Blood for the Blood God! Skulls for the Skull Throne! 1k Death list - is it competitive? Hi there, I've got a question. On page 152 of Blades of Khorne, under notes for the Mighty Skullcrushers it says "Battleline if army has KHORNE BLOODBOUND allegiance and its general is a Lord of Khorne on Juggernaut". Now, this seems pretty straight forward. Effectively Mighty Skullcrushers can't be battleline if you bring units that don't have the KHORNE and BLOODBOUND keywords. It seems odd though, as Skaarac is a no-go in this case. As are all KHORNE DAEMONS. Odd, but I can accept that. Here's where it gets weird: On page 78 the ALLEGIANCE sidebar says: Okay, so the army can be either KHORNE or BLOODBOUND? Or can't we have a BLOODBOUND allegiance? If we can't, then the note for the Mighty Skullcrushers makes no sense. But okay, I'm assuming we can. And here's comes the kicker. Page 78 also says: That effectively means that blood tithe is only available to KHORNE armies - not BLOODBOUND armies. And we can only choose one. So, my question is as follows: How does it make sense that you need to have the BLOODBOUND allegiance to field Mighty Skullcrushers as battleline, but you must have the KHORNE allegiance to generate blood tithe? Also KHORNE and BLOODBOUND are separate keywords. So how is a KHORNE BLOODBOUND allegiance even possible? By that logic you could field a CHAOS KHORNE army, a CHAOS BLOODBOUND army, or even a MORTAL BLOODBOUND army as well. None of which would qualify for blood tithe. I can't wait for an updated FAQ. Hi i'm trying to make death army and I need some advice. My list: Vampire Lord on Zombie Dragon 440 Wight King with Baleful Tomb Blade (Totem) 120 Necromancer 120 Corpse Cart 80 Blood Knights x 5 260 Morghast Arcai 240 Zombies x 40 (Battleline) 240 Total: 1500 Point Total model: 51 I'm trying to make synergy with Wight King + Necromancer + Corpse Cart + 40 Zombies : Front line And have Vampire Lord on ZD + Blood Knights + Morghast Arcai : Flanks Magic synergy with Morghast + Corpse Cart Should I remove Morghasts and add Dire wolves and make more synergy with my front line and add Grave Guard or Hexwraiths or Black knights for more flanks?